The bazooka dates back to experiments carried out by the scientist, Robert H. Goddard, in the 1920s. It consisted of a lightweight metal tube held on the shoulder, from which a fin-stabilized rocket could be fired. 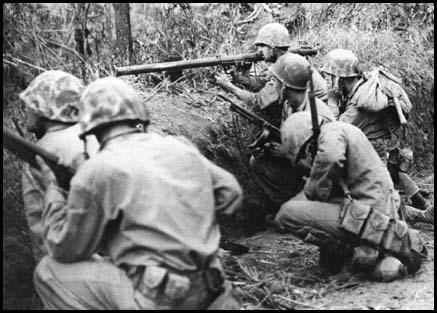 In the Second World War scientists returned to the idea and in 1942 the bazooka became an important anti-tank weapon for the US infantry. It fired a 3.4lb rocket to a range of 400 yards. The Red Army was supplied with this weapon to use on the Eastern Front against the Germans. After managing to capture some of these weapons, the German Army introduced the Panzerschreck. Based on the bazooka, the German version fired a 7.3lb rocket around 165 yards. US Soldier using a bazooka in Okinawa in 1945.